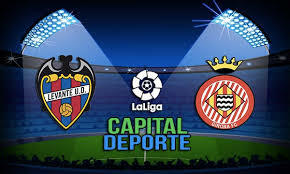 Levante welcomes Girona in a game from the 18th round of the Spanish La Liga. Here are our thoughts about this clash at the Estadio Cuidad de Valencia on Friday night. At this moment Levante are 10th in La Liga with 22 points won and a record of 6 wins, 4 draws and 7 losses. In terms of current form, they are not doing really well lately, winning only one of their last five games – against Athletic Bilbao. In the other four matches they made two draws and suffered two losses. In their last fixture Levante suffered a second consecutive defeat, losing against Rayo Vallecano away from home. Ruben Rochina scored Levante’s only goal in the game, but Rayo managed to win with an own goal from Tono and Raul de Tomas. Before this unsuccessful visit to Rayo, Levante suffered another loss against the champion Barcelona, conceding a heavy 0-5 defeat at home against the Catalans. As for Girona, the Catalan club is 9th in the standings with 22 points, being on par with their next opponent. At this moment Girona’s record in the league shows 5 wins, 7 draws and 5 losses. In their last five games the Catalans won only once – against Espanyol, also doing two draws and suffering two defeats against Athletic Bilbao and Sevilla. In their last game Girona made a 1-1 draw against Getafe at home. Angel opened the score for the visitors, but Girona managed to win a point thanks to an equalizing goal from Bernardo Espinosa just 5 minutes before the end of the game. That’s our thoughts about the La Liga fixture between Levante and Girona from the 18th round of the Spanish league. These two teams are very close to each other in the standings, so it’s difficult to pick a favourite here. Good luck. Copyright © 2019 Top Betting Tip.